Event planner Cate Graham gives brides and grooms tips on how to not drop the ball if you’re getting married when the ball drops. What are some pros and cons for getting married on around or on New Year’s Eve? There’s an undeniable sense of romance and magic in the air around the holidays and definitely several pros in choosing this time of year to tie the knot. For example, many venues will already be lavishly decorated which could help save on your design costs. However, make sure you book your venue in advance, especially if you plan to get married in a church. Furthermore, as New Year’s Eve is one of the busiest times of the year for party planning, some services are in such high demand that their fees can double for this night---namely bands, limousines, catering services and hotel accommodations. It would also be wise to book these early! How can I balance the vibe between being a New Year’s Eve party and a wedding reception? Let’s face it, every year we are patiently waiting for the best New Year’s Eve party invite. 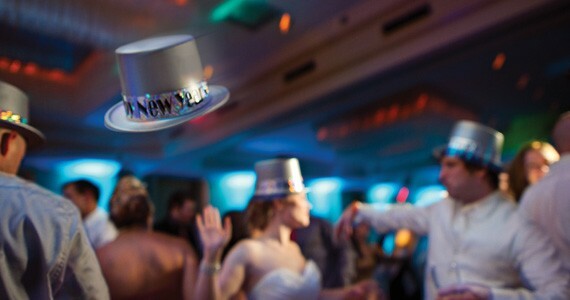 A NYE wedding can be a great alternative as partying on this night can truly add up quickly. A wedding is a guaranteed recipe for a great night, especially if they include an open bar and late night snacks! There’s no denying that it’s New Year’s Eve, even if it is your wedding, so be sure to include such festivities as party hats and noise makers, champagne for toasting and the ever-famous midnight kiss. If your budget allows, why not include confetti streamers and fireworks too? That being said, don’t hesitate to decorate in your favourite colours and include your personality and style in the details. After all that’s what a wedding does best---blends the best of both worlds! Is there specific etiquette for getting married on or near a holiday? It’s always a good idea to keep your guests in mind when planning your special day. However, it’s even more important during the holidays as several of your guests will have multiple family and other engagements. To avoid complications make sure you give your loved ones plenty of advance notice, especially if you wish for them to be a part of your bridal party. Typically save-the-dates are sent to out-of-town guests about six months before the wedding. However, since there’s a never ending abundance of parties and events during the holidays it is courteous to send out your save-the-dates eight months beforehand, this will help ensure your date is marked in everyone’s calendars first. All other general rules apply but with holidays such as New Year’s Eve we usually suggest you take extra care to arrange transportation and accommodations for your guests’ safety, and your peace of mind.